Mittal Group’s DD Mittal Tower is now ready and on 14th April the CM of Punjab shall inaugurate it. On 14th April block, no 1 and 2’s 96 flat owners will get their portion. On the auspicious occasion of Baisakhi, CM Mr. Badal shall give keys to the owner. On this occasion, Village Development Minister Mr. Sikhander Singh and CPI Mr. Swaroop Chand Singla will be present. 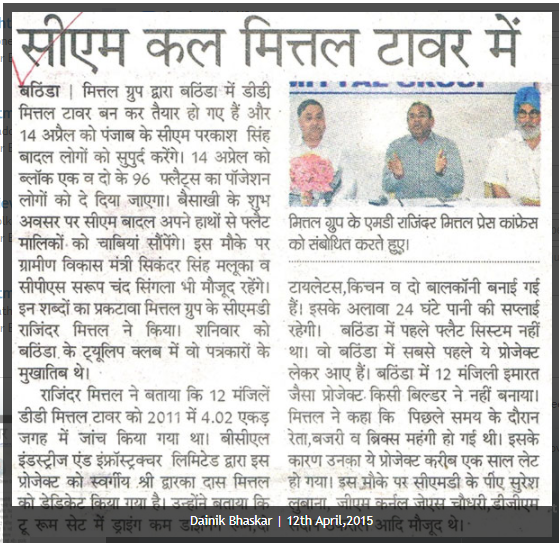 This was told to us in words by Mittal Groups’ CMD Mr. Rajendra Mittal. On Thursday, he had a conversation with reporters at tulip club. Sh. Rajendra Mittal told that in 2011, they planned for 12-floor building in an area of 4.02 Acres. BCL Industries & Infrastructures Limited was dedicated to Late. Sh. D D Mittal. He told that two room set has dining and drawing room, with two attached bathrooms, and balcony for the both rooms. There will be 24hrs water supply. Bathinda never had flat built. This is first 12 story building, which was never built by a builder. He also told that last year there was hike in the prices of bricks, sand, and stones. This caused the project delay. In the event his PA Mr. Suresh Labana, GM Col. J S Chowdhary and DGM Mr. Tukral were present.